I’m a big fan of doing a little and getting a lot. That makes me sound a bit lazy, so I’ll elaborate. If I can make a wonderfully flavorful dinner in 30 minutes as opposed to an hour or two, that leaves more time for me to do other things (like whip up some awesome dessert…) In my opinion, Real Simple reigns supreme when it comes to these types of recipes. I’m rarely disappointed when I make something that I find in that lovely publication. 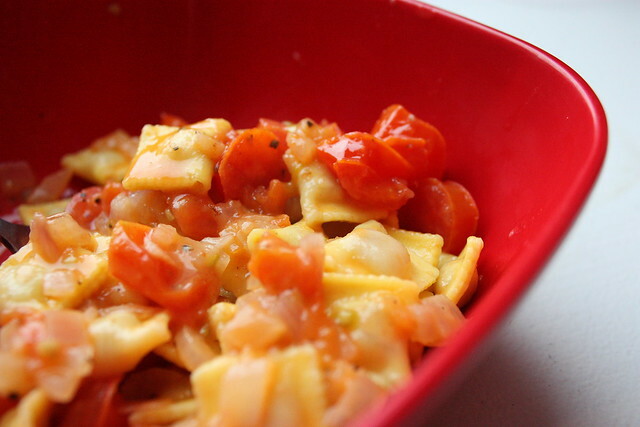 These ravioli dishes are no exception. You can find the first recipe on Real Simple’s site over here and the second recipe is right here. They are inexpensive, really simple to prepare, quick (as I mentioned above), and delicious beyond all reason. Do yourself a favor and make this right now. Or make it when I include it in another food for $40 menu :)! you had me at BACON! Hello from Blogtoberfest! Your blog is lovely. Olivia– Bacon makes everything better, right! ?Sharmaine– I hope you enjoy it :). They're both so delicious! 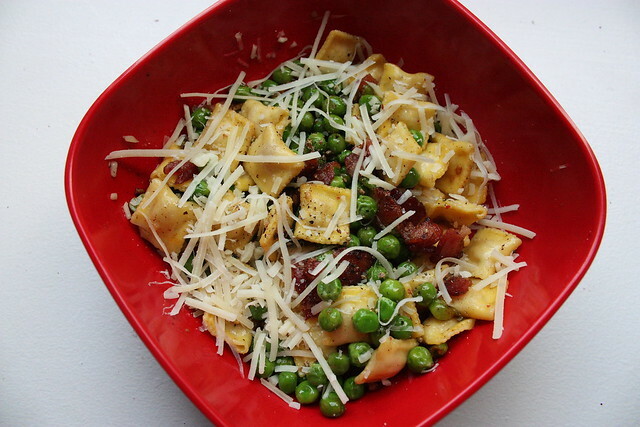 ravioli with peas and bacon!? oh that sounds like heaven!!! and the boyfriend will LOVE it!